The present invention relates to a haemostatic material comprising a carrier layer and a material for wound contact comprising at least one haemostat in particulate, granular, powder, flake or short fibrous form. Such a haemostatic material is useful, for example, in reducing or stopping bleeding of a physiological target site in a person or animal, and can also be used to stem bleeding during medical procedures. 本申请为分案申请，原申请的申请日为2009年4月27日，申请号为200980125639.X(PCT/GB2009/001065)，发明名称为“止血材料”。  The present application is a divisional application of parent application filed April 27, 2009, Application No. 200980125639.X (PCT / GB2009 / 001065), entitled "hemostatic material." 本发明涉及止血材料。  The present invention relates to hemostatic materials. 止血材料在(例如)减少或停止人或动物的生理学目标位点的出血中有用。 Bleeding hemostatic material (for example) to reduce or stop the human or animal physiological target site useful. 该材料还可以在医学程序(medical procedure)期间用于阻止出血。 The material can also be used to stop bleeding during medical procedures (medical procedure). 存在多种情况，其中人或非人的动物可能会创伤或受伤，从而导致出血。  There are many situations in which human or non-human animals may be trauma or injury, resulting in bleeding. 在受伤较轻的情况下，可以通过身体的天然止血机制阻止出血，所述机制导致血液凝固以形成防止出血并辅助修复受损血管的凝块。 In the case of minor injuries, can prevent bleeding through the body's natural hemostatic mechanism, the mechanism leading to the formation of blood clotting and prevent bleeding secondary to repair damaged blood vessels clots. 在一些情况下，可以施用基本的急救以阻止血流并辅助伤口愈合，如通过对伤口施加连续压力以阻止患者中的血流。 In some cases, it may be administered to prevent blood basic first aid and assist wound healing, such as by applying a continuous pressure to the wound to prevent the patient's bloodstream. 这使得凝血因子能够在伤口位点处收集并形成凝结的血块以阻止血流。 This makes it possible to collect and clotting factors in the blood clot formation at the wound site to prevent blood flow. 然而，该技术不适合于严重伤口以及具有多个出血点的伤口。 However, this technique is not suitable for severe bleeding wounds and wounds having a plurality of points. 因此，出血仍是主要的死亡原因。 Therefore, bleeding is still the leading cause of death. 由出血所引起的死亡是如战场的环境中的特别的问题。  bleeding caused by the death of a particular problem, such as the battlefield environment. 通常，在这些情况中引起的伤口伴随大量出血，并且多数导致死亡。 Typically, in these cases accompanied by heavy bleeding wounds caused, and most lead to death. 出血还是平民在损伤后的主要死亡原因。 The main cause of death was bleeding after injury of civilians. 在尝试提供有助于阻止伤口血流的产品中，已开发出了止血产品。  In attempting to provide help to prevent wound blood products, we have developed a hemostatic product. 止血剂通常以固体粉末或颗粒形式，或以液体形式存在。  Typically hemostatic agent, in liquid form or a solid powder or particulate form. 所有这些形式均是可流动的，它们为伤口通常的不规则表面提供了良好的接触从而可以实现良好止血。 All of these forms are flowable, they provide good contact with the wound can be typically irregular surface to achieve good hemostasis. 然而，液体止血剂微粒的可流动性质还使它们在使用时相对难以控制。 However, the liquid hemostatic agent particles can further flow properties making them relatively difficult to control during use. 将可流动的止血剂保留在需要阻止血流的伤口位点处，这可以是个问题。 Flowable hemostatic agent remains desirable to prevent blood flow at the wound site, which can be a problem. 这些药剂包括以商标名QuikC丨ot®出售的产品。  These agents include the brand name QuikC Shu ot® sell products. QuikClot®包含沸石化合物， 其从伤口的血流中吸水从而使存在于血液中的凝血因子浓缩并且使血液凝固加快，因此所述的沸石和凝固的血液一起形成了阻止血流的凝块。 QuikClot® compound comprises a zeolite, so that the water absorption is present in the blood and the concentrate of coagulation factors from a blood coagulation accelerating wound in the bloodstream, thus preventing blood clots formed with the zeolite and coagulated blood. 在这种产品的开发中，提供了包含止血剂的纱布袋。  In the development of this product, there is provided a gauze bag comprising a hemostatic agent. 虽然这改善了止血剂处理和应用的容易性，但是该纱布袋物理地将止血剂与伤口位点处的身体组织和血液分开。 Although this improves the ease of handling and application of the hemostatic agent, but the gauze bag body tissue is physically separated from the haemostatic agent at the wound site and blood. 这降低了止血剂的效力。 This reduces the effectiveness of the hemostatic agent. 另外，尽管该纱布袋是柔软的，但是由于该纱布袋的孔小于保留在该纱布袋中的止血剂的典型粒度，因此止血剂颗粒不能移动到该袋的外部并进入到伤口的任何缝隙或不规则表面中。 Further, although the gauze bag is flexible, but due to the hole in the gauze bag remains in a typical particle size is smaller than the gauze bag hemostatic agent, hemostatic agent particles and therefore can not be moved to the outside of the bag and into the wound or any gap irregular surfaces. 该纱布袋保持在原位直至除去。 The gauze bag remains in place until removed. 在WO 02/102276中说明了另一种产品。  Another product described in WO 02/102276. 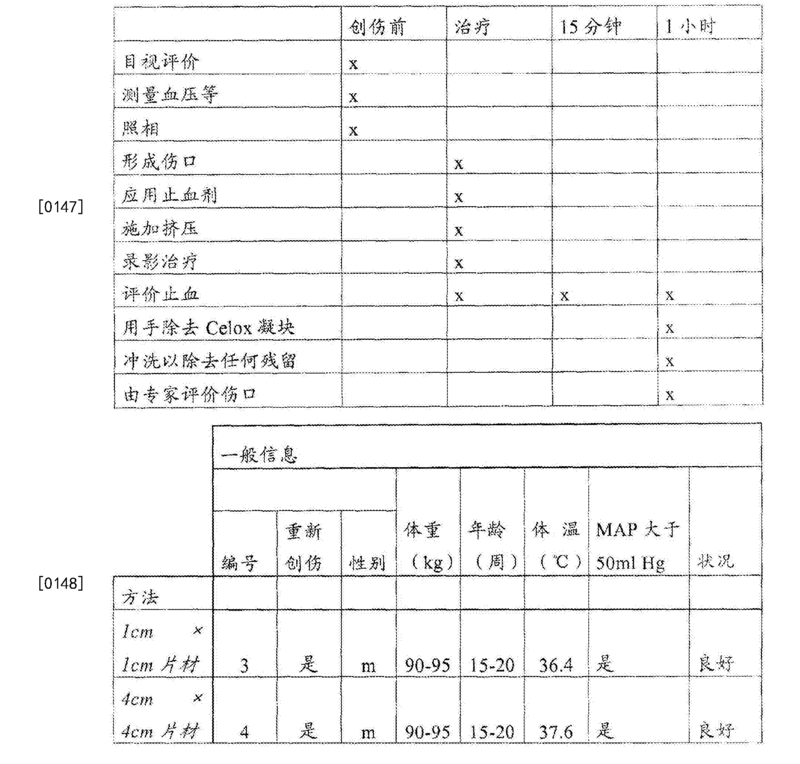 该产品为包含壳聚糖层的平面单片敷料。 The product is a monolithic planar dressing layer comprises chitosan. 它不包含作为伤口接触层的颗粒或薄片。 It does not contain particles or flakes as the wound contact layer. 将所述敷料应用到伤口位点并形成密封。 The application of the dressing to the wound site and form a seal. 所述的壳聚糖导致血液凝固，它与所述片材所形成的密封一起阻止血流。 The chitosan results in blood coagulation, sealing with said sheets are formed together preventing blood flow. 然而，这些产品必须直接应用到出血源，即，动脉。 However, these products must be applied directly to the bleeding source, namely, arteries. 这种应用需要技术和准确度。 Such applications require technique and accuracy. 军医和第一反应人不具有必要的技术以鉴别出血源并对其应用敷料。 Medical first reaction and do not have the necessary technology to identify the source of bleeding and apply the dressing. 在任何情况下，在战场上或在损伤位点进行这种精巧操作将会是极其困难的。 In any case, on the battlefield or in such a delicate operation site of the injury it will be extremely difficult. 另外，当除去根据WO 02/102276所述的片材时，由于除去了密封层，因此重新开始出血。 Further, when the sheet is removed according to the WO 02/102276, due to removal of the sealing layer, and therefore bleeding resumed. GB 2095995和GB 2129300公开了使用纯壳聚糖乙酸盐作为止血材料。  GB 2095995 and GB 2129300 disclose the use of pure chitosan acetate as a hemostatic material. 然而，由于在短时间内只有所述材料的最外层表面可用于发生作用，因此由所述纯盐所形成的凝胶是非常薄的。 However, since only the outermost surface of the material it can be used to play a role in a short time, and therefore the gel formed by the pure salt is very thin. 通常，这种材料不能停止出血并且即使在能够停止出血时，所述凝决也非常薄和脆弱，从而当患者活动时，该凝块会受到破坏并恢复出血。 Typically, this material can not be stopped even when the bleeding and the bleeding can be stopped, the condensate must be very thin and fragile, so that when the patient is active, the clot can be damaged and restored bleeding. 因此，本发明的目标是提供止血材料，其相对快速地阻止生理学目标位点的血流并且使用容易、安全。  Accordingly, the object of the present invention to provide a hemostatic material which prevents relatively quickly physiological target site blood flow and ease of use, safety. 根据本发明，提供了包含载体层和伤口接触材料的止血材料，所述伤口接触材料包含微粒(particulate)、粒状(granular)、粉末、薄片或短纤维形式的至少一种止血剂。  According to the present invention, there is provided a haemostatic material comprising a carrier layer and a wound contact material, said wound contacting material comprises particles (Particulate), granular (Granular), powder, flake or short fibrous form at least one hemostatic agent. “止血剂”表示当与血液接触时能够产生停止或减少出血的凝块或阻塞的任何药剂。  "haemostatic agent" means that when contacted with blood can generate any agent to stop or reduce bleeding or clot obstruction. 生理学目标位点可以是动物身体中或身体上的任何位点。  physiological target site may be any site on the animal body or body. 所述动物可以是人或非人动物。 The animal may be a human or non-human animal. 所述生理学目标位点可以是伤口，或者它可以是在医学程序期间（例如，手术期间）所造成的身体中的开口。 The physiological target site may be a wound, or it may be a body during a medical procedure (e.g., during surgery) resulting in the opening. 在下文中，为了方便起见并且仅出于说明性的目的，将所述生理学目标位点称为伤口。 Hereinafter, for convenience and illustrative purposes only, the physiological target site is called the wound. 本发明所述的止血材料可以通过仅具有基本医学训练的人应用。 Haemostatic material according to the invention  This may be applied by a person having only basic medical training. 也就是简单地将所述材料应用到所述生理学目标位点并随后施加压力。 That is simply the material is applied to the physiological target site and then applying pressure. 有利地，根据本发明所述的止血材料易于处理和应用。  Advantageously, easy handling and application of the haemostatic material according to the present invention. 在应用前，它通常储存在干燥环境中。 Before application, it is typically stored in a dry environment. 利用生物过程的产品倾向于是温度依赖的。  The use of biological processes products tend to be temperature dependent. 通常，失血的患者由于在战场上作战而非常热或者由于已暴露于较冷的条件而非常冷。 In general, patients with blood loss due to the fighting on the battlefield and very hot conditions or due to have been exposed to cold and very cold. 目前可用的产品在这些极端温度下有效性较低。 Currently available products less effective in these extreme temperatures. 有利地，本发明所述的材料不受温度波动的影响，并因此在高于和低于正常体温(37°C)的温度下能够同样良好地工作。 Advantageously, the material according to the present invention is not affected by temperature fluctuations, and can therefore operate equally well at temperatures above and below normal body temperature (37 ° C) of. 根据本发明所述的止血材料可以具有不同的形式。  may have different forms of haemostatic material according to the present invention. 根据本发明的一个方面，可以使用热和/或压力将所述止血剂粘合(bonded)到所述载体层上。 According to one aspect of the present invention, using heat and / or pressure to the hemostatic adhesive agent (bonded) onto the carrier layer. 根据另一个方面，可以将所述粘合剂和止血剂混合在一起并置于所述载体层上。  According to another aspect, the binder may be mixed together and hemostatic agent and placed on the carrier layer. 根据另一个方面，所述载体层的两侧均至少部分地涂覆了所述止血剂。  According to another aspect, both sides of the carrier layer are at least partially coated with the haemostatic agent. 所述止血剂通常以相同的方式粘合到所述载体层的两侧。 The hemostatic agent is typically bonded to both sides of the carrier layer in the same manner. 根据另一个方面，在混合的粘合剂/止血剂层的上方，或者在分离的粘合剂和止血剂层的上方，或者在通过热和/或压力粘合到所述载体层的止血剂层的上方，可以具有其它层，所述其它层包含可溶、可分散或可除去的保留材料。  According to another aspect, the above adhesive / haemostat layer mixed, or separated at the top and the hemostatic adhesive agent layer, or by heat and / or pressure bonding to the carrier layer above the hemostatic agent layer may have other layers, the further layer comprising a soluble, dispersible or removable retaining material. 当将所述止血材料应用于伤口时，这种材料被体液溶解或降解，或在体液中分散。 When the hemostatic material to the wound, this material is dissolved or degraded by bodily fluids, or dispersed in a body fluid. 这种其它层还可以用于保留（retain)所述止血剂。  Such other layer may also be used to retain (The retain) the hemostatic agent. 它可以是由如明胶或纤维素衍生物的多糖制成的可溶薄膜，或者它可以由如聚乙酸乙烯酯(PVA)或聚乙烯醇(PVOH)的可溶成膜剂制成。 Soluble film which may be made of gelatin or a polysaccharide such as a cellulose derivative, or it may be a polyvinyl alcohol (PVOH) as a soluble polyvinylacetate (PVA) film former, or made. 可分散薄膜通常将含有如以上所列那些的水溶性材料和如纤维素纤维的其它不溶材料，并且所述薄膜将会在润湿时分散。  The dispersible film will usually contain water-soluble material such as those listed and other insoluble materials such as cellulose fibers or more, and will be dispersed in the film when wet. 可除去层可以是在使用前可以剥去的任何片材或网。 Any layer may be removed sheet or web may be stripped prior to use. 可溶或可分散表示所述的层在与动物身体中的伤口位点接触时的条件下可溶或可分散，如温度在约32至约45°C之间以及所接触的体液的性质和pH。  The soluble or dispersible represent said soluble or dispersible in a layer under the body when in contact with an animal in the wound site, such as a temperature between about 32 to about 45 ° C and in contact with a body fluid the nature and pH. 在这些条件下，所述的层通常是基本完全可溶或可分散的。 Under these conditions, the layer is typically substantially completely soluble or dispersible. 具体地，所述的层在水或水成液中可溶，和/或它在水或水成液(aqueous liquid)中降解或分散。 In particular, said layer in water or an aqueous liquid of a soluble and / or its degradation or dispersion in water or an aqueous liquid (aqueous liquid). 术语可溶和可分散不是互斥的。 The term soluble and dispersible are not mutually exclusive. 最通常地，所述的可溶、可分散或可除去的保留层由对人或动物体内代谢敏感的材料形成。 Most commonly, the soluble, dispersible or removable retaining layer is formed from a human or animal metabolism sensitive material. 根据另一个方面，在所述载体层的上表面和下表面上均可以布置混合的粘合剂/止血剂层，由于它通常为片材形式，因此这些表面是两个较大的材料表面。  According to another aspect, the upper surface of the support layer and the lower surface can be arranged mixed adhesive / haemostat layer, since it is usually in the form of a sheet, these two surfaces are larger material surface. 这使得能够更有效地减少或停止伤口中的血流，并且所述伤口有可能在本发明所述材料周围封闭。 This makes it possible to more effectively reduce or stop blood flow in the wound, and the wound is closed around the possible materials of the present invention. 作为另外一种选择，所述分离的粘合剂和止血剂层可以位于所述载体层的上表面和下表面上，或者可以通过热和/或压力将止血剂粘合到所述载体层的上表面和下表面上。 Alternatively, a separate adhesive and haemostat layers may be positioned on the upper surface of the support layer and the lower surface, or may be bonded to the carrier layer by heat and / or pressure hemostat an upper surface and a lower surface. 在所述粘合剂和止血剂作为分离的层存在于一个或两个表面上，或者作为混合的粘合剂/止血剂层存在于一个或两个表面上，或者另外如果没有粘合剂并且使用热和/或压力将所述止血剂粘合到所述载体层的一个或两个表面上的所有情况下，包含可溶、可分散或可除去的保留材料的所述其它层可存在于一个或两个表面上。  exists as a separate layer on one or both surfaces of the adhesive and hemostatic agent, or as a mixed adhesive / haemostat layer is present on one or both surfaces, or otherwise if no sticky the mixture using heat and / or pressure bonded to the hemostatic agent in all cases on one or both surfaces of the carrier layer under comprising a soluble, dispersible or removable retaining material may be other layers It may be present on one or both surfaces. 还可以将所述止血剂掺入到包含可溶、可分散或可除去的保留材料的所述其它层中。  The hemostatic agent may also be incorporated into comprising a soluble, dispersible material the retention or removal of other layers. 根据本发明的一个实施方式，所述止血剂材料将具有两个相同的侧面。  According to an embodiment of the present invention, the hemostatic agent material having the same two sides. 这可以通过使用相同方法分别处理每个侧面，或通过同时处理两个侧面实现。 This can be processed by each side, respectively, using the same method, or by simultaneously processing both sides realized. 根据另一个实施方式，选择所述粘结物质从而即使在用血液润湿时，即使除去了所述载体层后，至少部分止血剂将会保留在出血区域中。  According to another embodiment, the bonding substance selected so that even when wetted with blood, even after removal of the carrier layer, at least part of the haemostatic agent will remain in the bleeding area. 先前所开发的止血材料在一旦除去该材料后不会在伤口位点处留下任何止血剂，因此出血将会恢复。 Previously developed hemostatic material without leaving any hemostatic agent at the wound site once the material is removed, thus bleeding will resume. 可以通过使所述止血剂粘合从而在润湿时能够从所述粘合层上释放来实现这种情况。  such that when wet may be adhered to achieve this can be released from on the adhesive layer by the hemostats. 如果所述粘合层或所述止血剂对水足够敏感从而当该组合润湿时会减弱这种粘合时，则这是有效的。 If the adhesive layer of the hemostatic agent or sufficiently sensitive to water such that when the wetting composition may reduce this adhesion, this is effective. 所述粘合剂不必溶解以允许这种情况，而是只要减弱或改变形状即可。 The binder need not be dissolved to allow this, but as long as the shape can be reduced or changed. 通常，所述粘结物质在如血液的体液条件下至少部分可溶，并且不会对要治疗的人或动物身体造成显著有害影响。  Generally, the bonding material at least partially soluble in body fluids such as blood conditions, and do not cause a significant deleterious effect on the human or animal body to be treated. 根据本发明的一个实施方式，所述止血剂为多糖或壳聚糖盐。  According to an embodiment of the present invention, the hemostatic agent is a polysaccharide or chitosan salt. 壳聚糖是来自贝类加工的固体废物的衍生物，并且可以从真菌培养中提取。 Chitosan is a derivative from shellfish processing solid waste, and can be extracted from the fungal culture. 它是水不溶性阳离子聚合物材料。 It is water-insoluble cationic polymeric material. 因此，对于本发明的使用来说，首先将壳聚糖转化为水溶性盐。 Thus, using the present invention, the chitosan is first converted to water-soluble salts. 因此，所述壳聚糖盐在血液中可溶以形成阻止血流的凝胶。 Thus, the chitosan salt is soluble in blood to prevent blood flow to form a gel. 由于壳聚糖易于在身体中分解，因此壳聚糖盐理想地适合于本文所述的应用。  Since chitosan easily decomposed in the body, and therefore ideally suited for the chitosan salt applications described herein. 通过溶菌酶将壳聚糖转化为氨基葡萄糖，并因此天然地从身体中排出。 Lysozyme into chitosan glucosamine, and thus naturally discharged from the body. 不必采取任何措施以将壳聚糖从身体中除去。 No need to take any action to remove from the body to chitosan. 此外，壳聚糖盐表现出温和的抗菌性质，因此使用它们降低了感染的风险。  In addition, chitosan salts exhibit mild antibacterial properties, so they are used to reduce the risk of infection. 适合于本发明使用的示例性壳聚糖盐包括，但不限于，单独或组合形式的任意下列物质：乙酸盐、乳酸盐、琥珀酸盐、苹果酸盐、硫酸盐或丙烯酸盐。  Suitable examples of salts of chitosan in the present invention include, but are not limited to, alone or in combination of any of the following: acetate, lactate, succinate, malate, sulfate or acrylic salt. 它们通常为粉末形式。 They are typically in powder form. 所提供的上述实例仅是为了举例说明而不意欲以任何方式进行限制。 The foregoing examples are provided for purposes of illustration only and not intended to be limiting in any way. 通常，在本发明中使用的壳聚糖盐为壳聚糖琥珀酸盐。  In general, the chitosan salt used in the present invention is chitosan succinate. 通过将壳聚糖与适当的酸混合制备壳聚糖盐。  By chitosan prepared by mixing with a suitable acid chitosan salt. 将理解所述的酸可以是任何无机或有机酸，其获得了在与人或动物身体有关的条件下(特别是在血液中）可溶的壳聚糖盐。 It will be appreciated the acid may be any inorganic or organic acid, which is obtained in the human or animal body related conditions (particularly in blood) soluble chitosan salt. 技术人员将会识别出适合的酸。 In the art will recognize suitable acid. 例如，在这些条件下，壳聚糖磷酸盐是不溶的，并且因此磷酸是不适合的。 For example, under these conditions, chitosan phosphate is insoluble and therefore is not suitable phosphate. 根据一个实施方式，所述止血剂组成了按重量计至少约5%的所述止血剂，或者更通常地，组成了按重量计至少约20 %的所述止血剂。  According to one embodiment, the hemostatic agent composition of the hemostatic agent by weight of at least about 5 percent, or more typically, the composition of the hemostatic agent by weight of at least about 20%. 所述止血剂通常为粒状，或者它可以包含长度不超过约7.5mm的短纤维，更通常地，包含长度不超过约5_的短纤维。 The  Hemostatic agents are typically granular, or it may comprise a length of no more than about 7.5mm staple fibers, more typically, a length of no more than about 5_ comprise staple fibers. 存在时，所述粘合层包含用于将所述止血剂结合到所述载体层上的粘结物质。  When present, the adhesive layer comprises a hemostatic agent for binding to the binding substance on the carrier layer. 通常，所述粘结物质是可熔材料。 Typically, the bonding material is a fusible material. 通常使用粉末粘合、热粘合、物理和乳胶粘合制备无纺织物。  Generally a powder adhesive, thermal bonding, latex bonding and physical preparation of the nonwoven fabric. 所有这些方法均可以改变以适应于将所述止血剂结合到所述载体层上。 All of these methods may be varied to accommodate binding to the haemostat to the carrier layer. 粉末粘合使用可熔粉末，其通常基于聚酯、聚丙烯、丙烯酸或聚乙烯。  Using a fusible powder is powder bonding, which is typically based on polyester, polypropylene, acrylic or polyethylene. 热粘合使用可熔纤维，如基于聚丙烯、聚酯、聚乙烯的那些。 Thermally fusible bonding fibers may be used, such as based on polypropylene, polyester, polyethylene those. 乳胶粘合使用了液态胶乳粘合剂，例如，它可以是基于丙烯酸的。 Latex adhesive using liquid latex binder, for example, it may be based on acrylic acid. 当通过如压力的作用力将材料物理地缠绕或推压时，发生了物理粘合。 When such a force by the pressure of the material is wrapped or physically pressed physical bonding occurred. 典型的材料包括，但不限于，低恪共聚多酯树脂和De Inet，它是由De IStarTechnologies，Inc公司提供的可恪网。  Typical materials include, but are not limited to, low Ke copolyester resin and De Inet, it is by De IStarTechnologies, Inc Ke can be provided by the network. 根据一个实施方式，所述载体层包含粘胶无纺布材料，或者作为另外一种选择，它可以包含纺织纱布、薄膜、泡沫或凝胶片。  According to one embodiment, the carrier layer comprises a viscose non-woven material, or alternatively, it may comprise a woven gauze, a film, a foam or a gel sheet. 所述载体材料的材料在与人或动物身体中或身体上的伤口有关的条件下可以或不可以降解。 Material of the carrier material is wound in a human or animal body or physical condition may or may not be related to degradation. 然而，根据本发明的一个实施方式，所述载体材料的材料可在身体中安全降解从而使得可以在手术使用或治疗后将所述整个止血材料片保留在原位。 However, according to one embodiment of the present invention, the material of the carrier material can be safely degrade in the body can remain in place so that the surgical or therapeutic use of the whole sheet after the hemostatic material. 安全并且可降解材料的实例包括，但不限于，氧化的纤维素、胶原、聚己内酯(polycaprylactone)、聚乳酸、聚交酯-共聚乙交酯(polylactide-co-glycolide)、聚乙交酯、几丁质等。 Examples of safe and degradable materials include, but are not limited to, oxidized cellulose, collagen, polycaprolactone (polycaprylactone), polylactic acid, lactide - co-glycolide (polylactide-co-glycolide), polyglycolide esters, chitin and the like. 所述材料可以采取任何适合的形式并且可以以处理伤口所必须的不同尺寸范围、形状和厚度提供，如正方形、矩形、圆形或椭圆形。  The material may take any suitable form and may be processed in different size ranges, the shape and thickness necessary to provide a wound, such as square, rectangular, circular or elliptical. 例如，所述材料可以是一般的平面形状，并且相对于它的宽度/深度来说，高度较低。 For example, the material may be a generally planar shape, with respect to its width / depth, the height is low. 可以使用任何规则或不规则的形状。 You may use any regular or irregular shape. 它可以以较大的片材提供，所述片材可以切割成所需的尺寸。 It may be provided in a large sheet, the sheet may be cut to the desired size. 所述材料的厚度可以根据需要在上限和下限之间改变。  The material thickness may vary between the upper and lower limits as needed. 所述厚度的上限通常为约2cm，而下限为几微米，如5-10微米。 The upper limit of thickness is usually about 2cm, while the lower limit of a few microns, such as 5-10 microns. 然而，重要的一点是所述材料是柔性的，从而可以将其弯曲以适合身体的轮廓，并且它通常能够达到可以围绕直径为约Icm或更小的管卷绕的易于弯曲的程度。 However, it is important that the material is flexible so that it can be curved to fit the contours of the body, and it is generally easy to achieve the degree of bending of the tube may be wound around a diameter of about Icm or less. 根据本发明的一个实施方式，所述止血材料还可以包含医学表面活性剂。  According to an embodiment of the present invention, the hemostatic material may also comprise a surfactant medicine. “医学表面活性剂”表示对接触人或动物身体或施用于人或动物身体是药物可用的并且对人或动物身体不会造成任何明显有害作用的任何表面活性剂。 "Medical surfactant" indicates a human or animal body in contact with or administered to a human or animal body the drug is available to the human or animal body and does not cause any surfactant any significant detrimental effects. 在本发明中使用的示例性医学表面活性剂包括单独或组合形式的任何下列物质:基于环氧乙烷和环氧丙烷的嵌段共聚物(例如，BASFPhmmics®)、甘油、聚乙二醇、丙二醇、如月桂酸、油酸的脂肪酸、其它脂肪酸和脂肪酸盐，基于硅酮的表面活性剂和乳化剂。 Exemplary medical surfactants for use in the present invention include, alone or in any combination of the following materials: block copolymers based on ethylene oxide and propylene oxide (e.g., BASFPhmmics®), glycerol, polyethylene glycol, propylene glycol, such as lauric acid, oleic fatty acids, other fatty acids and fatty acid salts, surfactants and emulsifiers based on silicone. 通常使用月桂酸和油酸。 Usually lauric acid and oleic acid. 所述医学表面活性剂通常组成了按重量计从约0.001至约10%的所述止血剂。  The medical composition of the surfactant is typically by weight of the hemostatic agent is from about 0.001 to about 10%. 更有利地，所述医学表面活性剂组成了按重量计从约0.5至约1%的在本发明中使用的所述止血剂。  More advantageously, the medical composition of surfactant by weight of the hemostatic agent is used from about 0.5 to about 1% in the present invention. 有利地，表面活性剂的存在造成了良好的润湿性能。 Advantageously, the presence of the surfactant causes good wetting properties. 所述止血剂的润湿方式对其性能是至关重要的。 Wetting embodiment the hemostatic agent is critical to its performance. 也就是说，所述止血剂可以过快地吸收血液并且只是与血液简单混合而没有发生充分的凝胶化从而形成能够阻止血流的凝胶凝块。 That is, the hemostatic agent may be absorbed into the blood too quickly and simply mixed only with the blood of not sufficiently gelled to form a gel clot in the blood can be prevented. 在另一个方面，如果所述止血剂吸收血液过慢，则仅在少量止血剂中发生凝胶化，通常是在最接近伤口位点的最初几毫米深的止血剂中。 In another aspect, the hemostatic agent is absorbed into the blood if too slow, the gelling occurs only in a small amount of the hemostatic agent, usually in the first few millimeters of depth closest to the wound site hemostatic agent. 在这种情况下，所形成的凝胶凝块不够致密从而不能在允许将患者转移到医疗中心的足够时间段内阻止血流。 In this case, the formed gel-clot and thus can not dense enough to allow a sufficient period of time to transfer the patient to a medical center preventing blood flow. 通常，在转移患者时，该凝胶凝块将破坏并且将恢复出血。 Typically, when transferring the patient, the gel will destroy the clot and restore bleeding. 已发现对性能至关重要的另一个因素是所使用的止血剂的粒度。  The particle size of the hemostatic agent has been found to be another critical performance factor is used. 通过它将通过或保留的筛网的尺寸来测量所述粒度。 The particle size is measured by size through which a screen or reserved. 根据一个实施方式，当所述止血剂为微粒或粒状时，它的平均粒度为大于约200目从而它将不会通过200目筛网。  According to one embodiment, when the hemostatic agent is a particulate or granular form having an average particle size of greater than about 200 mesh so that it will not pass through a 200 mesh sieve. 所述平均粒度通常可以大于约100目，更通常地，大于约50目，并且不希望所述颗粒或微粒能够通过40目筛网。 The average particle size typically be greater than about 100 mesh, more typically, greater than about 50 mesh, and the undesirable particles or granules through a 40 mesh screen. 更有利地，所述表面活性剂的粒度与所述止血剂的粒度基本相同。  More advantageously, the surfactant particle size and particle size substantially the same as the hemostatic agent. “基本相同”表示所述颗粒的相对尺寸相差不超过约10%，更通常地，相差不超过约5 %。 "Substantially identical" indicates the relative size of the particles differ by no more than about 10%, more typically, by no more than about 5%. 通过研磨所述止血剂并通过如筛分的任何适合方式分类实现了最佳粒度。 By grinding the hemostatic agent in any suitable manner such as by screening to achieve the optimal particle size classification. 这些分级方法是本领域技术人员所熟知的，并且将不再进一步说明。 The fractionation methods are well known to the skilled person, and will not be further described. 根据另一个实施方式，可以将适量的至少一种惰性材料加入到所述止血材料中。  According to another embodiment, it may be a suitable amount of at least one inert material is added to the hemostatic material. 已发现通过将一定量的惰性材料和/或医学表面活性剂加入至所述止血剂中，即，实际上稀释了止血剂的量，所述止血剂的性能确实得到进一步提高。  It has been found by a quantity of inert material and / or medical surfactant is added to the hemostatic agent, i.e., the amount actually dilute hemostatic agent, the hemostatic agent does performance is further improved. 由于所述惰性材料的存在进一步提高了所述医学表面活性剂的性能(并且反之亦然），因此所述惰性材料和所述医学表面活性剂在一起的组合是特别有利的。 Due to the presence of the inert material to further improve the performance of the medical surfactant (and vice versa), so the inert material of the medical composition and surfactant together is particularly advantageous. 通常，所述惰性材料为粒状。 Typically, the inert particulate material. 所述惰性材料可以包括任何非快速凝胶化止血剂，S卩，在应用到出血伤口约30秒至约1分钟内凝胶化的止血剂。 The  Inert material may include any non-rapid gelling hemostat, S Jie, applied to a bleeding wound within about 30 seconds to about 1 minute gelling hemostatic agent. 示例性惰性材料包括，但不限于，纤维素、煅制二氧化硅、沙、粘土、海藻酸盐、微晶纤维素、氧化再生纤维素、聚乙二醇、瓜耳豆胶、黄原胶、壳聚糖、壳聚糖衍生物、几丁质、蔗糖、乳糖、果胶、羧甲基纤维素、粉碎的玉米粉、胶原、明胶、聚乙烯醇、丙烯酸、如Carbopol®的丙烯酸酯(共)聚物、基于交联丙烯酸的聚合物、硫酸钡、粘土、乳糖、蔗糖、淀粉或它们中任意两种或更多种的组合。  Exemplary inert materials include, but are not limited to, cellulose, fumed silica, sand, clay, alginate, microcrystalline cellulose, oxidized regenerated cellulose, polyethylene glycol, guar gum, xanthan gum, chitosan, chitosan derivatives, chitin, sucrose, lactose, pectin, carboxymethylcellulose, ground corn meal, collagen, gelatin, polyvinyl alcohol, acrylic acid, such as the Carbopol® acrylate (co) polymer, crosslinked polymer of acrylic acid, barium sulfate, clay, lactose, sucrose, starch, or any combination of two or more thereof based. 通常，使用选自壳聚糖、几丁质和羧甲基纤维素的一种或多种惰性材料。 Typically, selected from chitosan A chitin and carboxymethyl cellulose or more inert materials. 可以将所述惰性材料以高达按重量计约95%的总组成(total composition)的量加入到所述止血剂中，通常以高达按重量计约90%的量加入，并且更通常地以高达按重量计约80 %的量加入。  The inert material may by up to an amount of about 95% by weight of the total composition (total composition) is added to the hemostatic agent, usually in an amount of up to about 90% by weight is added, and more generally was added in an amount of up to about 80% by weight of. 所述止血剂通常具有从约3.5至约8.0的pH。 The  hemostat generally has a pH of from about 3.5 to about 8.0. 该pH很大程度上取决于所使用的特定止血剂，因为它们分别具有不同的pH。 The pH is largely dependent on the particular hemostatic agent used, because they have different pH. 就本发明而言，所述可溶、可分散或可除去的保留材料的溶解或分散的速率可以变化。  For the present invention, the soluble, retention rate of the dissolved or dispersed material may be dispersed or removed may vary. 当存在时，所述(一种或多种）材料的溶解或分散速率越大，则所述止血剂在与水或(一种或多种)体液接触后的暴露或释放速率也越大，从而产生了所需的治疗效果。 When present, the greater the rate of dissolving or dispersing the (one or more) of the material, is exposed to the hemostatic agent or the greater the release rate upon contact with water or (one or more) of body fluids, resulting in the desired therapeutic effect. 在一些情况下，可能希望在所述材料与水或(一种或多种)水流体接触后并且在所述止血剂暴露或释放前存在短暂的延迟期，从而留出了在所述目标位点定位和(如果需要）重新定位所述材料的处理时间。  In some cases, it may be desirable and after exposure to water or the material (s) in contact with the aqueous fluid or hemostatic agent there is a brief lag period before release, thus leaving in the positioning said target site and the processing time (if needed) repositioning the material. 可以通过选择不同的可溶或可分散材料和/或它们的不同组合来改变所述可溶、可分散或可除去的保留材料的性质。  The soluble can be changed by selecting a different soluble or dispersible material, or different combinations and / thereof, retain the properties of the material may be dispersed or removable. 因此，可以根据所需的溶解或分散速率、温度敏感度、pH敏感度等选择材料或其组合。 Thus, according to a selection or a combination thereof can be dissolved or dispersed materials required rate, temperature sensitivity, pH sensitivity and the like. 还可以改变接受器(receptacle)的厚度以调节所包含的止血剂的释放或暴露速率。 You can also change the thickness of the receptacle (RECEPTACLE) to regulate the release agent contained in the hemostatic or exposure rate. 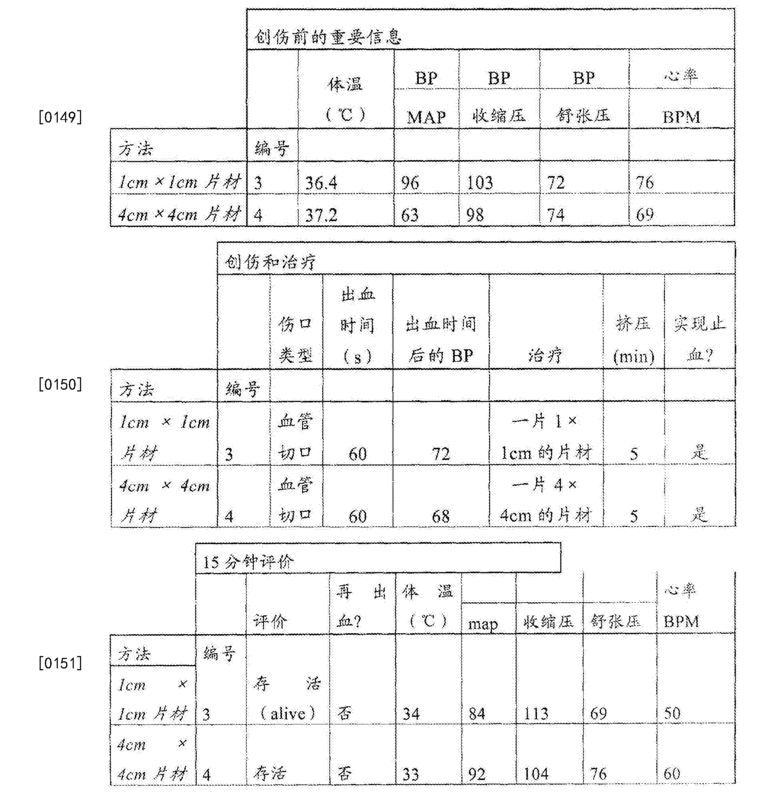 这些选择将在技术人员的正常理解和能力之内。 These options will be within the normal capacity of understanding and technical personnel in. 将理解溶解或分散速率可以随所述目标位点的温度而改变。  The rate of dissolution or dispersion can be appreciated that as the temperature of the target site is changed. 所述水溶性或水分散性材料可以在约〇至约100 °C的温度下易于溶解或分散，如约45 °C或以下，更优选地，约41°C或以下，最优选地，约37°C或以下。 The water-soluble or water-dispersible material can be readily dissolved at about billion to about a temperature of 100 ° C or dispersion, such as from about 45 ° C or less, and more preferably, from about 41 ° C or less, and most preferably, from about 37 in ° C or less. 仅通过举例说明，可以希望在体温时，所述可溶、可分散或可除去的保留材料在暴露于水或水流体的约1秒至约120秒内开始溶解或分散，如在约5秒至约120秒内，优选地在约60秒内，最优选地，在约30秒内。  Only by way of example, it may be desirable at body temperature, the soluble, dispersible or removable retaining material begins to dissolve or disperse in water or exposed to aqueous fluid for about 1 second to about 120 seconds, as in within about 5 seconds to about 120 seconds, preferably within about 60 seconds, and most preferably, within about 30 seconds. 所述材料的基本完全溶解或分散可以发生在约1秒至约30分钟内，如在约5分钟内，优选地在约3分钟内，最优选地在约2分钟内。 Substantially complete dissolution or dispersion of the material may occur within about 1 second to about 30 minutes, such as within about 5 minutes, about 3 minutes, preferably within most preferably about 2 minutes. 可溶、可分散或可除去的保留材料的溶解或分散可以是pH依赖的，从而提供了具有PH敏感的溶解或分散速率的材料。  soluble, dispersible material is dissolved or retained removable or dispersion may be pH-dependent, thereby providing a material with a dissolved or dispersed PH sensitive rate. 这可以用于保持所述材料在引入到身体前不会溶解或分散。 This can be used to hold the material prior to introduction into the body without dissolving or dispersing. 构成所述接受器的材料还可以包含任意组合形式的下列一种或多种物质:增塑剂(如甘油、丙二醇、聚乙二醇）、不溶性物质（inso Iubl is ing agent)、可溶性物质(soIubI ising agent)、表面活性剂、分散的不溶材料、增加分散的材料（dispersionadding materials)、铸造助剂（casting aids)、粘合助剂、粘合剂或使所述接受器在暴露于光化学、紫外线、生物学或化学源后易于分散的材料。  The acceptor material may also comprise any combination of one or more substances of the following: plasticizers (e.g., glycerol, propylene glycol, polyethylene glycol), insoluble material (inso Iubl is ing agent), soluble substances (soIubI ising agent), a surfactant, a dispersed insoluble material, increasing the dispersion material (dispersionadding materials), additives casting (casting aids), adhesion aids, binders or exposed in the receptacle after photochemical, UV, chemical, or biological source material dispersed easily. 在所述可分散的保留层中还可以存在不溶于水的材料。  There may also be water-insoluble material in the retaining layer of dispersible. 当存在这些不溶于水的材料时，这些材料可以包括，例如，任意组合形式的下列一种或多种物质：纤维素、几丁质、二氧化硅、不溶于水的纤维素衍生物、海藻酸钙、沸石、沙、白垩、水可溶胀的化合物和聚合材料，如聚氨脂或聚异丁烯。 When these water-insoluble materials, which may include, for example, one of the following or any combination of more substances: cellulose, chitin, silica, water-insoluble cellulose derivatives, alginic calcium, a zeolite, sand, chalk, water-swellable polymeric compounds and materials, such as polyurethane or polyisobutylene. 该列表不是完全的。 This list is not complete. 当将壳聚糖用作本发明所述材料中的止血剂时，通过制备微粒、粒状、粉末、薄片或短纤维形式的壳聚糖与在壳聚糖不溶的溶剂(通常为80:20的乙醇：水）中的适当酸的混合物制备了活性基础（active base)。  When chitosan is used as the material of the hemostatic agent of the present invention, by preparing microparticles, granules, powder, flake or short fibrous form insoluble chitosan and chitosan in a solvent (usually 80 : 20 ethanol: water mixture on an active basis) in the preparation of the appropriate acid (active base). 蒸发所述溶剂以提供基本地活性基础材料(substantially active base material)。 Evaporating the solvent to provide substantially the active base material (substantially active base material). 然后，可以根据需要将所述活性基础材料与惰性材料和/或医学表面活性剂混合以提供所述止血剂。 Then, according to the active base material with an inert material and / or medical mixed surfactant required to provide the hemostatic agent. 可以以无菌或非无菌形式提供所述止血材料。  In the hemostatic material may be provided sterile or non-sterile form. 在以无菌形式提供所述材料的情况下，可以使用任何通常已知的方法进行灭菌，如γ照射、电子束处理、热处理等。 In the case where the material is provided in sterile form, any commonly known method for sterilization, such as γ irradiation, electron beam treatment, and heat treatment. 可以结合一种或多种防腐剂提供处于非无菌形式的材料。 It may be combined to provide one or more preservatives of materials in a non-sterile form. 根据本发明的另一个实施方式，还提供了压迫绷带或急救绷带系统，其中将所述止血片材用作吸收剂垫的正面。  According to another embodiment of the present invention, there is provided a compression bandage or emergency bandage system where the haemostatic sheet is used as an absorbent pad front. 所述止血片材将允许任何过量的血液通过该片材，其中所述血液将会被后面的所述吸收剂垫吸收。 The hemostatic sheet would allow any excess blood through the sheet, wherein the blood will be absorbed by the pad of the rear absorbent. 根据本发明的另一个实施方式，还提供了压迫绷带或急救绷带系统，其中所应用的止血片材与绷带处于成卷或折叠布置从而允许在使用压迫绷带前能够将其容易地压入到(packed into)较深的伤口中。  According to another embodiment of the present invention, there is provided a compression bandage or emergency bandage system where the haemostatic sheet and applied in a bandage or folded into a roll can be arranged so as to allow it to be easily pressed prior to use compression bandage into (packed into) deep wound. 事实上，所述止血材料卷可连接或不连接到所述绷带系统。 Indeed, the hemostatic material roll may be connected or not connected to the bandage system. 根据本发明的另一个实施方式，还提供了所述止血材料的形式，它是所述材料的较薄的约I cm宽的卷，它可以用于相对较小的伤口或用于如鼻出血的情况。  According to another embodiment of the present invention, there is provided in the form of the hemostatic material, which is a relatively thin material from about I cm wide roll, it can be used for relatively small wounds or as in the case of nasal bleeding. 根据本发明的另一个实施方式，还提供了如本文所述的止血材料，其中所述止血材料还包含不透过X射线的适量材料，如果要在治疗或手术后将其保留在伤口中，则这将允许所述材料被检测。  According to another embodiment of the present invention, there is provided a haemostatic material as described herein, wherein the hemostatic material further comprises an amount of X-ray impermeable material, if you want to leave it after treatment or surgery wounds, this would allow the material to be detected. 根据本发明的另一个实施方式，还提供了如本文所述的止血材料，其中在血管通路手术（vascular access operation)后使用较小的成型片材-例如，约1英寸Xl英寸(2.52cmX2.52cm)-密封动脉。  According to another embodiment of the present invention, there is provided a haemostatic material as herein described, wherein the smaller molded sheet after vascular access surgery (vascular access operation) - e.g., about 1 inch Xl inch ( 2.52cmX2.52cm) - sealing arteries. 根据本发明的另一个实施方式，还提供了如本文所述的止血材料，其中将所述材料用作急救膏上的吸收剂垫。  According to another embodiment of the present invention, there is provided a haemostatic material as described herein, wherein the material is used as an absorbent pad on a first aid cream. 根据本发明的另一个实施方式，还提供了如本文所述的止血材料，其中所提供的片材具有位于其大致中心处的孔。  According to another embodiment of the present invention, there is provided a haemostatic material as described herein, the sheet having an aperture provided therein positioned substantially at the center thereof. 在该实施方式中，所述止血材料的形状可以大致为圆形，但是根据需要也可以是任何形状。 In this embodiment, the shape of the hemostatic material may be substantially circular, but may be any required shape. 所述材料中的所述的孔使得所述材料能够在要进入人或动物体内的通路口和管、线等周围使用。 Said hole in said material such that the material can be used in human or animal body to enter the tube through the junctions and, lines around. ii)将一定量的止血剂与所述载体层接触，其中所述止血剂为微粒、粒状、粉末、薄片或短纤维形式。  ii) the amount of hemostatic agent in contact with the carrier layer, wherein the haemostat is in particulate, granular, powder, flake or short fibrous form. 使用粘合剂或通过使用热和/或压力可以保持所述止血剂与所述载体层接触。  using an adhesive or may retain the hemostatic agent in contact with the carrier layer by using heat and / or pressure. 本发明还提供了减少或停止伤口处血流的方法。  The present invention further provides a method of reducing or stopping blood flow at the wound. 因此，提供了减少或停止血流的方法，包括以下步骤:在可能的情况下清洁伤口区域，将止血材料应用到所述伤口区域，其中所述止血材料包含载体层以及包含微粒、粒状、粉末、薄片或短纤维形式的至少一种止血剂的伤口接触材料，和对伤口区域施加恒定压力直至形成凝胶凝块。 Accordingly, there is provided a method of reducing or stopping blood flow, comprising the steps of: cleaning the wound area where possible, the hemostatic material to the wound region, wherein the hemostatic material comprises a carrier layer and comprises a particulate, granular, powder , wound contact material at least one hemostatic agent in the form of flakes or short fibers, and apply a constant pressure to the wound area until the gel clot formation. 通常，将所述恒定压力施加到所述伤口区域至少约3分钟。  Generally, the constant pressure applied to the wound area of ​​at least about 3 minutes. 本发明还提供了止血材料，其包含载体层以及包含微粒、粒状、粉末、薄片或短纤维形式的至少一种止血剂的伤口接触材料，所述止血材料用于生产止血伤口敷料。  The present invention further provides a haemostatic material comprising a carrier layer and comprises a particulate, granular, powder, flake or short fibrous form of at least one kind of wound contacting material hemostatic agent, a hemostatic material for producing a haemostatic wound dressing. 根据本发明的另一个方面，提供了包含止血材料的止血伤口敷料，其中所述止血材料包含载体层以及包含微粒、粒状、粉末、薄片或短纤维形式的至少一种止血剂的伤口接触材料。  According to another aspect of the invention there is provided a haemostatic wound dressing comprising a haemostatic material, wherein the haemostatic material comprises a carrier layer and comprises a particulate, granular, powder, flake or short fibrous form of at least one kind of wound hemostatic agent contact material. 根据本发明的另一个方面，提供了止血材料在减少或停止伤口血流中的应用，其中所述止血材料包含载体层以及包含微粒、粒状、粉末、薄片或短纤维形式的至少一种止血剂的伤口接触材料。  According to another aspect of the present invention, there is provided the use of hemostatic material in reducing or stopping blood flow in the wound, wherein the hemostatic material comprises a carrier layer and comprises a particulate, granular, powder, flake or short fibrous form at least a wound contact material hemostatic agent. 本发明所述的止血材料在减少或停止伤口血流(blood flow from awound)中特别有效。 Haemostatic material according to the present invention is particularly effective in reducing or stopping blood flow in the wound (blood flow from awound) in. 仅I克止血剂的部分(a fraction of a gram of haemostat)就足以密封出血的动脉。 Only I g portion of the hemostatic agent (a fraction of a gram of haemostat) sufficient to seal arterial bleeding. 现在将参考下列实施例和附图，通过举例进一步说明本发明，所述实施例和附图仅旨在进行说明而绝不限制本发明的范围。  Reference will now be made to the accompanying drawings and the following examples, the present invention is further illustrated by way of example, the embodiments and the drawings are intended to be merely illustrative and in no way limit the scope of the present invention. 图1显示了根据本发明的止血材料的图示，所述止血材料具有作为分离的层的粘合层和止血剂。  FIG. 1 shows an illustration of the hemostatic material of the present invention, the hemostatic material as a separate layer having an adhesive layer and a hemostatic agent. 图2显示了根据本发明的止血材料的图示，所述止血材料具有混合在一起形成一个层的粘合层和止血剂。  FIG. 2 shows an illustration of the hemostatic material of the present invention, the hemostatic material having an adhesive layer and haemostat mixed together to form a layer. 图3显示了根据本发明的止血材料的图示，所述止血材料具有混合在一起形成一个层的粘合层和止血剂以及位于其上方的可溶、可分散或可除去的保留层。  Figure 3 shows an illustration of the hemostatic material of the present invention, the hemostatic material having an adhesive layer and haemostat mixed together to form a layer thereof and located above the soluble, dispersible or removable retention of Floor. 图4显示了根据本发明的止血材料的图示，所述止血材料具有位于所述载体层任一侧的混合的粘合剂/止血剂层。  Figure 4 shows an illustration of the hemostatic material of the present invention, the hemostatic material in said mixed adhesive having any side of the carrier layer / haemostat layer. 图5显示了根据本发明的止血材料。  FIG. 5 shows the hemostatic material of the present invention. 图6显示了根据本发明的止血材料的近视图。  Figure 6 shows a close-up view of the hemostatic material of the present invention. 图7显示了通过使用16号针对动脉进行血管穿刺从而在猪中产生的伤口。  FIG. 7 shows the vascular puncture wound through the artery using a No. 16 for producing in pigs. 图8显示，指定的出血时间后，将根据本发明的IcmX Icm的止血材料片材应用到伤口以阻止血流。  Figure 8 shows that the bleeding time after a specified, a sheet material will be applied in accordance with the present invention, the hemostatic IcmX Icm to prevent blood flow to the wound. 图9显示了根据本发明的止血材料用于在猪中阻止血流。  Figure 9 shows the blocking of blood flow in the pig haemostatic material according to the present invention. 根据需要，施加稳定的压力长达5分钟。 According to need, the pressure exerted stable up to 5 minutes. 图10显示根据本发明的4cm X 4cm的止血材料片材，用于在猪中阻止血流。  FIG. 10 shows a haemostatic material according 4cm X 4cm sheet of the present invention for preventing blood flow in the pig. 图1显示，止血剂2位于粘合剂层4上方，粘合剂层4又位于载体层6上。  Figure 1 shows, hemostats 2 positioned above pressure-sensitive adhesive layer 4, the adhesive layer 4 and layer 6 on a support. 该实施方式中，粘合剂层和止血剂构成了分离的和不同的层。 This embodiment, the adhesive layer and haemostat constitute a separate and distinct layers. 根据本发明另一种实施方式，止血剂2可与粘合剂层4混合以形成组合层8。  According to another embodiment of the present invention, the hemostatic agent 2 may be mixed with the adhesive layer 4 in a combination of layer 8 is formed. 图2显示了这种实施方式。 Figure 2 shows such an embodiment. 组合层8位于载体层6的上方。 8 is located above the carrier layer 6 is combined layer. 图4中可看出，可在本发明的止血材料中应用两个组合层8,一个在载体层6上方，一个在载体层6下方。 In  As can be seen in FIG. 4, two compositions may be applied in the haemostatic material layer 8 of the present invention, a carrier layer 6 above, a carrier layer 6 below. 这允许更有效地减少和停止伤口中的血流，伤口有可能在本发明所述材料周围封闭。 This allows for more efficient and reduce the blood flow stopped wounds, the wound may be closed around said material of the present invention. 图5简单地显示了本发明的止血材料12的视图，该止血材料将用于减少或停止伤口血流。  FIG. 5 shows a simple view of the hemostatic material of the present invention 12, the hemostatic material for reducing or stopping blood flow in the wound. 图6显示了本发明所述的止血材料12的样品的近视图。  Figure 6 shows a close-up view of a sample hemostatic material of the present invention 12. 可以清楚地看出所述载体层6的非均一结构(texture)。 It is clear that non-uniform structures (Texture) of the carrier layer 6. 图7显示了通过使用16号针对动脉进行血管穿刺从而在猪中产生的伤口。  FIG. 7 shows the vascular puncture wound through the artery using a No. 16 for producing in pigs. 在将所述止血材料12应用到所述伤口前，使所述伤口出血一段时间，通常约60秒。 Before the haemostatic material 12 is applied to the wound, the wound bleeding period of time, typically about 60 seconds. 然后将一定量的所述止血材料12 (在该情况下为IcmX Icm的片材)应用到所述伤口（图8)以阻止血流。 And then the amount of the hemostatic material 12 (in this case a sheet IcmX Icm) is applied to the wound (FIG. 8) to stop the blood flow. 对所述伤口施加稳定挤压以确保所述材料与所述伤口之间的最大接触（图9)。 Is applied to the wound to ensure maximum stability pressing contact between said material and the wound (FIG. 9). 根据需要，所述挤压可以维持长达5分钟。 If necessary, the extrusion can be maintained up to 5 minutes. 挤压一段时间后并且当出血停止时，将所述止血材料12保留在原位以防止重新开始出血。  After a period of time and, when pressing the bleeding stops, the hemostatic material 12 will remain in place to prevent renewed bleeding. 在图10中，显示了起这种作用的4cm X 4cm的止血材料12的片材。 In Figure 10, a sheet of hemostatic material play this role 4cm X 4cm 12. 可以看出所述止血材料12吸收血液的位置。 As can be seen the position of the hemostatic material 12 absorbs the blood. 将粒状止血剂(Celox)粘合至使用熔化范围在58-6TC的低熔共聚多酯树脂制成的12(^8111的无纺材料（75%的粘胶(〇31111；1^1-2)纤维/25%的聚稀经纤维）上。与6(^81]1的Celox—起使用了40gsm的树脂。  A granular haemostat (the Celox) bonded to the melting range of the use made of the copolyester resin is a low-melting 58-6TC of nonwoven material 12 (^ 8111 (75% viscose (〇31111; ^ 1 1-2) on the fiber / 25% polypropylene fibers by dilute). Celox- starting with 6 (^ 81] uses a resin 40gsm. 将Celox粉末和粘结物质颗粒共同混合，然后将该混合的粉末“分散”涂覆到连续移动幅材中的无纺材料上。  The Celox powder and bonding agent granules were mixed together, and the mixed powder "dispersion" is applied to the continuously moving web of nonwoven material. 将所述幅材置于从第二加热运送带下方通过的加热运送带上，所述两个带对所述涂覆的幅材施加热和挤压从而将所述粘结物质和Celox粉末融合到所述幅材上。 The web from the transport belt disposed below the second conveying belt heated by the heating, the two extruded strip and applying heat to the coated web so that the bonding agent and the Celox powder fusion onto the web. 可以改变热粘合方法以改变粘合程度。  The method of thermal bonding may be changed to vary the degree of adhesion. 根据需要，热、压力和时间（S卩，所述运送带的速度)均可以改变。 If necessary, heat, pressure and time (S Jie, the transport speed of the belt) can be changed. 所得的止血材料的表面是粗糙并且蓬松的（fluffy)(参见图5和6)。 Hemostatic material surface  of the resultant rough and fluffy (Fluffy) (see FIGS. 5 and 6). 然后，卷绕所述涂覆的热粘合幅材以形成卷(roll)。  Then, winding the coated web is thermally bonded to form a roll (roll). 将所得的材料切成5cmX5cm的正方形，并进行包装和灭菌。 The resulting material was cut into a square 5cmX5cm, and packaged and sterilized. 使用16号针在100镑重的猪的股动脉上开孔。  Using a 16 gauge needle in 100-pound pig femoral artery on the opening. 伤口严重出血。 Serious bleeding wound. 将所述材料应用到伤口位点，用手指压迫3分钟。 The material is applied to the wound site, compression with a finger for 3 minutes. 出血被强力地停止。 Bleeding is stopped forcefully. 3分钟后，将所述材料从出血区域移除。 After 3 minutes, the material is removed from the bleeding area. 没有重新开始出血。 No restart bleeding. 使用16号针在100镑重的猪的股动脉上再开一个孔。  Using a 16 gauge needle on a 100-pound pig femoral artery to open a hole. 伤口严重出血。 Serious bleeding wound. 将所述材料保持在伤口位点上，压迫最底限的30秒。 The material retained on the wound site, most repressive floor for 30 seconds. 即使采用这种最底限的治疗，也能强力地停止出血。 Even with this most bottom line of treatment, but also strongly to stop the bleeding. 3分钟后，将所述材料从出血区域移除。 After 3 minutes, the material is removed from the bleeding area. 仍然没有重新开始出血。 Still bleeding did not restart. 将粒状止血剂(Celox)粘合至使用熔化范围在58-6TC的低熔共聚多酯树脂制成的12(^8111的无纺材料（75%的粘胶(〇31111；1^1-2)纤维/25%的聚稀经纤维）上。与4(^81]1的Celox—起使用了40gsm的树脂。  A granular haemostat (the Celox) bonded to the melting range of the use made of the copolyester resin is a low-melting 58-6TC of nonwoven material 12 (^ 8111 (75% viscose (〇31111; ^ 1 1-2) on the fiber / 25% polypropylene fibers by dilute). Celox- starting with 4 (81 ^] 1 uses 40gsm resin. 此外，应用压辊以使得所述颗粒的表面平滑，从而提高了对所述载体材料的粘合。  Further, the pressure application roller so that the surface smoothness of the particles, thereby improving the adhesion of the carrier material. 所得的材料是平滑的。 The resulting material is smooth. 然后，卷绕所述涂覆的热粘合幅材以形成卷，将所得的材料切成5 cm X 5 cm的正方形，并进行包装和灭菌。  Then, winding the coated web is thermally bonded to form a roll, the resulting material was cut into 5 cm X 5 cm squares, and packaged and sterilized. 将粒状止血剂(Celox)粘合到使用熔化范围在58-61°C的低熔共聚多酯树脂的Imm厚的聚氨酯泡沫上。  A granular haemostat (the Celox) adhered to a polyurethane foam using a melting range of Imm-thick low melt copolyester resin of 58-61 ° C. 与40gsm的Celox—起使用了40gsm的树脂。 Celox- from 40gsm and 40gsm using a resin. 将Celox粉末和粘结物质颗粒共同混合，然后将该混合的粉末“分散”涂覆到连续移动幅材中的无纺材料上。  The Celox powder and bonding agent granules were mixed together, and the mixed powder "dispersion" is applied to the continuously moving web of nonwoven material. 将所述幅材置于从第二加热运送带下方通过的加热运送带上，所述两个带对所述涂覆的幅材施加热和挤压从而将所述粘结物质/Celox粉末融合到所述幅材上。 The web from the transport belt disposed below the second conveying belt heated by the heating, the two extruded strip and applying heat to the coated web so that the bonding agent / Celox powder fusion onto the web. 将粒状止血剂（Celox)粘合到使用熔化范围在58-61 °C的低熔共聚多酯树脂的120gsm的无纺材料上。  A granular haemostat (the Celox) bonded to a nonwoven material using a melting range of 120gsm low-melting copolyester resin at 58-61 ° C. 与40gsm的Celox—起使用了40gsm的树脂。 Celox- from 40gsm and 40gsm using a resin. 将Celox粉末和粘结物质颗粒共同混合，然后将该混合的粉末“分散”涂覆到连续移动幅材中的无纺材料上。  The Celox powder and bonding agent granules were mixed together, and the mixed powder "dispersion" is applied to the continuously moving web of nonwoven material. 将所述幅材置于从第二加热运送带下方通过的加热运送带上，所述两个带对所述涂覆的幅材施加热和挤压从而将所述粘结物质/Celox粉末融合到所述幅材上。 The web from the transport belt disposed below the second conveying belt heated by the heating, the two extruded strip and applying heat to the coated web so that the bonding agent / Celox powder fusion onto the web. 然后，卷绕所述涂覆的热粘合幅材以形成卷。 Then, winding the coated web is thermally bonded to form a roll. 然后，将所述卷返回通过粘合机，并且将另外的40gsm的树脂和40gsm的Celox应用到所述织物的另一侧。  Then, the volume is returned by a bonding machine, and an additional resin 40gsm and 40gsm Celox applied to the other side of the fabric. 现在，所述织物具有两个止血表面。  Now, the fabric has two surfaces hemostasis. 将所得的材料切成5cmX5cm的正方形，并进行包装和灭菌。 The resulting material was cut into a square 5cmX5cm, and packaged and sterilized. 将胶原止血剂粘合到使用熔化范围在58-61°C的低熔共聚多酯树脂的120gsm的无纺材料上。  The collagen hemostat adhered to the nonwoven material using a melting range of 120gsm low-melting copolyester resin at 58-61 ° C. 与40gsm干胶原颗粒一起使用了40gsm的树脂。 Using 40gsm and 40gsm resin with dry collagen particles. 将胶原和粘结物质颗粒共同混合，然后将该混合的粉末“分散”涂覆到连续移动幅材中的无纺材料上。  The collagen and bonding agent granules were mixed together, and the mixed powder "dispersion" is applied to the continuously moving web of nonwoven material. 将所述幅材置于从第二加热运送带下方通过的加热运送带上，所述两个带对所述涂覆的幅材施加热和挤压从而将所述粘结物质/Celox粉末融合到所述幅材上。 The web from the transport belt disposed below the second conveying belt heated by the heating, the two extruded strip and applying heat to the coated web so that the bonding agent / Celox powder fusion onto the web. 然后，卷绕所述涂覆的热粘合幅材以形成卷。  Then, winding the coated web is thermally bonded to form a roll. 将所得的材料切成5 cm X 5 cm的正方形，并进行包装和灭菌。 The resulting material was cut into 5 cm X 5 cm squares, and packaged and sterilized. 使用16号针在100镑重的猪的股动脉上开孔。  Using a 16 gauge needle in 100-pound pig femoral artery on the opening. 伤口严重出血。 Serious bleeding wound. 将所述材料应用到伤口位点，用手指压迫3分钟。 The material is applied to the wound site, compression with a finger for 3 minutes. 出血减慢，但是开始时并未完全停止。 Bleeding slowed, but not stopped completely at the beginning. 将额外的材料重新应用另外的2分钟。 The extra material to re-apply for another 2 minutes. 出血停止。 Bleeding stopped. 10分钟后，将所述材料从所述出血区域移除。 After 10 minutes, the material is removed from the bleeding area. 没有重新开始出血。 No restart bleeding. 将氧化再生纤维素止血剂(碾碎的Surgicel)粘合到使用熔化范围在58-61°C的低恪共聚多酯树脂的120gsm无纺材料上。  The oxidized regenerated cellulose hemostat (milled Surgicel) adhered to 120gsm nonwoven material used in the low melting range 58-61 ° C Verified copolyester resin. 与40gsm的干ORC颗粒一起使用了40gsm的树脂。 Using a resin with 40gsm 40gsm ORC dry particles. 将ORC和粘结物质颗粒共同混合，然后将该混合的粉末“分散”涂覆到连续移动幅材中的无纺材料上。  The ORC and bonding agent granules were mixed together, and the mixed powder "dispersion" is applied to the continuously moving web of nonwoven material. 将所述幅材置于从第二加热运送带下方通过的加热运送带上，所述两个带对所述涂覆的幅材施加热和挤压从而将所述粘结物质/ORC粉末融合到所述幅材上。 The web from the transport belt disposed below the second conveying belt heated by the heating, the two extruded strip and applying heat to the coated web so that the bonding agent / ORC powder fusion onto the web. 然后，卷绕所述涂覆的热粘合幅材以形成卷。  Then, winding the coated web is thermally bonded to form a roll. 将所得的材料切成IOcm X 2cm的方形，并进行包装和灭菌。 The resulting material was cut into IOcm X 2cm square, and packaged and sterilized. 将氧化再生纤维素止血剂（碾碎的Surgicel)粘合到使用可熔网（Delnet)的120gsm的无纺材料上。 On  The oxidized regenerated cellulose hemostat (milled Surgicel) using an adhesive to melt web (Delnet) of 120gsm nonwoven material. 与40gsm的Celox颗粒一起使用了80gsm的网。 Use the net 80gsm with Celox granules of 40gsm. 将粘合网放置在所述载体材料的上方，然后将所述颗粒“分散”涂覆到连续移动幅材中的无纺材料上。  The bonded web is placed over the carrier material, and then the particle "dispersion" is applied to the continuously moving web of nonwoven material. 将所述幅材置于从第二加热运送带下方通过的加热运送带上，所述两个带对所述涂覆的幅材施加热和挤压从而将所述粘结物质/Celox粉末融合到所述幅材上。 The web from the transport belt disposed below the second conveying belt heated by the heating, the two extruded strip and applying heat to the coated web so that the bonding agent / Celox powder fusion onto the web. 然后，可以卷绕所述涂覆的热粘合幅材以形成卷。  Then, thermally bonded webs can be wound to form a roll of the coating. 将所得的材料切成5 cm X 5 cm的正方形，并进行包装和灭菌。 The resulting material was cut into 5 cm X 5 cm squares, and packaged and sterilized. 通过将其应用到使用16号针在健康约克夏猪(Yorkshire swine)上所产生的血管穿刺位点上，评价了其上包含Celox颗粒的根据本发明的止血材料的有效性。  By applying it to the site of vascular puncture using a 16 gauge needle on a healthy Yorkshire (Yorkshire swine) generated, which evaluated the effectiveness of Celox granules comprising haemostatic material according to the present invention. 所使用的材料为尺寸为IcmX Icm和4cmX4cm的片材，并且对每个血管切口仅使用了其中一种片材。 Materials  As used IcmX Icm and a size of the sheet 4cmX4cm, and uses one sheet for each vessel incision only. 图7-10显示了使用本发明所述的止血材料的伤口和随后的治疗。 7-10 show the wound and subsequent treatment of the hemostatic material of the present invention. 在受试者接受前，确认了每个可能受试者的适合性。 Before subjects underwent, confirmed the suitability of every possible subject. [0M6]下列表格详细地说明了所遵守的程序和测试受试者创伤前后的状况。 [0M6] The following table shows the situation before and after the compliance procedures and test subjects trauma in detail. 通过数据收集官员的目视评价对止血进行评价并由创伤外科医生确认。  Evaluation was visually evaluated by the data collection officers hemostatic confirmed by trauma surgeons. 在进行了5分钟的挤压以及另外2分钟的挤压后仍未止血（即出血)的伤口计为“失败”。 After performing the extrusion an additional 2 minutes and 5 minutes is not pressed hemostasis (i.e., bleeding) wounds counted as "failed." 在评价期间未发生不良临床事件。 Adverse clinical events did not occur during the evaluation period. 受试者从受伤中存活。  survival of the subject from the injured. 对伤口仅使用了一个本发明所述的材料片。 It uses only the wound sheet material according to the present invention. 在所述伤口中未发现动脉再出血。 Not found in the wound arterial bleeding. 在任一个时间点处未发现出血。  At any one point in time bleeding was found. 在猪的所有伤口中实现了100%的止血。 Hemostasis achieved in 100% of all wounds in pigs. 结果清楚地表明当应用于血管穿刺位点时，本发明所述的止血材料是有效的。  The results clearly show that when applied to a blood vessel puncture site, the hemostatic material of the present invention is effective. 当然，应理解本发明不意欲局限于上述实施例，这些实施例仅是为了举例说明。  Of course, it should be understood that the present invention is not intended to be limited to the above embodiments, these examples are only for purposes of illustration. 1. 止血材料，其包含载体层， 包含粘结物质的粘合层，其中所述粘结物质是可熔材料，和伤口接触材料，所述伤口接触材料包含至少一种止血剂，所述至少一种止血剂呈微粒、 粒状、粉末、薄片或短纤维形式，其中所述止血剂包括壳聚糖盐。 1. haemostatic material comprising a carrier layer, an adhesive layer comprising a bonding substance, wherein said substance is a meltable bonding material, and the wound contacting material, said wound contacting material comprises at least one hemostatic agent, at least one kind of hemostatic agent in particulate, granular, powder, flake or short fibrous form, wherein the hemostatic agent comprises a chitosan salt. 2. 根据权利要求1的止血材料，其中所述载体层的两个面均至少部分涂覆了止血剂。 2. A haemostatic material according to claim 1, wherein both faces of the carrier layer are at least partially coated with a hemostatic agent. 3. 前述权利要求中任一项的止血材料，其中所述止血剂包括两种或更多种止血剂。 Haemostatic material according to any preceding claim in claim 3, wherein said hemostatic agent comprises two or more hemostatic agents. 4. 根据权利要求1 -3中任一项的止血材料，其中使用止血剂与载体材料之间的粘合层使止血剂粘合到所述载体层上，其中粘合层和止血剂任选是分离的层，或者其中粘合层与止血剂任选是混合物的。 Haemostatic material according to claim any one of 1-3, wherein the adhesive layer between the hemostat to use with a carrier material so that the hemostatic agent is bonded to the carrier layer, wherein the adhesive layer and haemostat optionally layer is separated, or the adhesive layer and wherein the hemostatic agent is optionally a mixture. 5. 前述权利要求中任一项的止血材料，其含有位于所述载体层的上表面和下表面上的混合的粘合层/止血层，或者位于所述载体层的上表面和下表面上的分离的粘合层和止血层。 Haemostatic material according to any one of the preceding claims, comprising the mixing of an adhesive layer on the upper surface and a lower surface of the carrier layer / hemostatic layer or located on the surface of the carrier layer and lower surfaces the adhesive layer and the separation layer hemostasis. 6. 前述权利要求中任一项的止血材料，还包含位于粘附层和/或止血层上的可溶、可分散或可除去的保留层，其中所述可溶、可分散或可除去的保留层由对人或动物体内代谢敏感的材料形成。 Haemostatic material according to any of the preceding claims, further comprising a retaining layer located and / or soluble hemostatic layer on the adhesive layer, dispersible or removable, wherein said soluble, dispersible or removable retaining layer is formed from a human or animal metabolism sensitive material. 7. 前述权利要求中任一项的止血材料，其中所述壳聚糖盐包括选自壳聚糖乙酸盐、壳聚糖乳酸盐、壳聚糖琥珀酸盐、壳聚糖苹果酸盐、壳聚糖硫酸盐或壳聚糖丙烯酸盐中的一种或多种盐，和/或其中所述壳聚糖盐组成了按重量计至少5%的所述止血剂。 Haemostatic material according to any chitosan succinate, chitosan malate preceding claims, wherein said chitosan salt selected from the group comprising chitosan acetate, chitosan lactate, , chitosan, chitosan sulfate acrylate or one or more salts, and / or wherein the composition of the hemostatic chitosan salt, by weight of at least 5%. 8. 前述权利要求中任一项的止血材料，还包含医学表面活性剂，和/或至少一种惰性材料，并且其中所述医学表面活性剂任选组成了按重量计从0.001至10%的所述止血剂，其中所述医学表面活性剂任选包括选自基于环氧乙烷和环氧丙烷的嵌段共聚物、脂肪酸、脂肪酸盐、基于硅酮的表面活性剂和乳化剂中的一种或多种组分，任选脂肪酸选自月桂酸和油酸，和/或其中至少一种惰性材料包括选自以下的一种或多种:纤维素、煅制二氧化硅、沙、 粘土、海藻酸盐、微晶纤维素、氧化再生纤维素、聚乙二醇、瓜耳豆胶、黄原胶、壳聚糖、壳聚糖衍生物、几丁质、鹿糖、乳糖、果胶、羧甲基纤维素、粉碎的玉米粉、胶原、明胶、聚乙烯醇、 丙烯酸、丙烯酸酯(共)聚物、基于交联丙烯酸的聚合物、硫酸钡、淀粉或它们中任意两种或更多种的组合，和/或其中所述惰性 Haemostatic material according to any of the preceding claims, further comprising a medical surfactant and / or at least one inert material, and wherein the medical surfactant optionally by weight of the composition of from 0.001 to 10% the hemostatic agent, wherein the medical surfactant optionally comprise block copolymers selected based on ethylene oxide and propylene oxide, fatty acids, fatty acid salts, surfactants and silicone-based emulsifier one or more components, and optionally a fatty acid selected from oleic acid, lauric acid, and / or wherein the at least one inert material selected from the group comprising one or more of the following: cellulose, fumed silica, sand, clay, alginate, microcrystalline cellulose, oxidized regenerated cellulose, polyethylene glycol, guar gum, xanthan gum, chitosan, chitosan derivatives, chitin, deer, lactose, fruit gum, carboxymethylcellulose, ground corn meal, collagen, gelatin, polyvinyl alcohol, acrylic acid, acrylate (co) polymer, crosslinked acrylic acid-based polymers, barium sulfate, starch, or any two of them or more combinations thereof, and / or wherein said inert 材料组成了按重量计高达95%的所述止血剂。 Material of the hemostatic agent by weight up to 95%. 9. 前述权利要求中任一项的止血材料，其中所述载体层在人或动物体内可降解，和/或所述载体层包含粘胶无纺布材料，或其中所述载体层包含纺织纱布、薄膜、泡沫或凝胶片。 9. A haemostatic material according to the preceding claims, wherein the carrier layer in a human or animal body degradable and / or the carrier layer comprises a viscose non-woven material, or wherein the carrier layer comprises a woven gauze , film, foam or gel sheet. 10. 前述权利要求中任一项的止血材料，其中止血层或粘合层当接触液体时对水足够敏感以减弱它们之间的粘合，从而当所述伤口接触层被血液湿润时，如果除去所述载体层， 则所述止血剂的一部分将保持在伤口处。 10. A haemostatic material according to the preceding claims, wherein the hemostatic layer or adhesive layer when in contact with liquid water is sufficiently sensitive to weaken the adhesion therebetween, such that when said blood wound contact layer is wetted, if removing the carrier layer, the portion of the haemostat will remain at the wound. 11. 前述权利要求中任一项的止血材料，还包含在体内可降解的材料、吸收剂层、和/或一定量的不透过X射线的物质。 Haemostatic material according to any of the absorber layer, and / or amount of a substance opaque to X-rays of the preceding claims, further comprising a material degradable in vivo. 12. 前述权利要求中任一项的止血材料，用于生产止血伤口绷带或者用于减少或停止生理学目标位点血流。 12. A haemostatic material according to the preceding claims, for producing a hemostatic wound dressing, or for reducing or stopping blood flow physiological target site. 13. 止血伤口绷带或急救膏，其包含根据权利要求1-12中任一项的止血材料。 13. A hemostatic wound dressing aid or paste comprising 1-12 haemostatic material according to any one of claims. 14. 生产根据权利要求1-12中任一项的止血材料的方法，包括以下步骤： i. 提供载体层;和ii. 将一定量的止血剂与所述载体层接触，其中所述止血剂为微粒、粒状、粉末、薄片或短纤维形式，所述止血剂包括壳聚糖盐，其中使用包含粘结物质的粘合层保持所述止血剂与所述载体层接触，其中粘结物质是可熔材料。 14. A method of producing a hemostatic material according to any one of 1-12 claims, comprising the steps of: i providing a carrier layer; and ii. An amount of a hemostatic agent in contact with the carrier layer, wherein the hemostatic agent. particulate, granular, powder, flake or short fibrous form, the hemostatic agent comprises a chitosan salt, wherein the adhesive layer comprises an adhesive material to hold the hemostatic agent in contact with said carrier layer, wherein the adhesive substance is fusible material. ES2354130T3 (en) 2011-03-10 hemostatic agents with a base of clay and devices for their administration.